So, some songs won’t sync to your iPod? Did you connect your iPod to your computer and try to sync music from iTunes, but when you disconnected your iPod and looked, some (or all) of the songs didn’t transfer over? You may be curious “why won’t some songs sync to my iPod” but this is actually a common issue. Sometimes, music won’t sync properly, even after iTunes tells you that the transfer was successful. There can be many reasons why your songs won’t transfer correctly from iTunes to your iOS device. Your files are formatted incorrectly. If your music is not in a format that is readable by iOS (for example, if your song is in .WMA format), then it may not transfer over correctly. iTunes is in theory supposed to convert certain file formats before you transfer them, but it doesn’t always. There is a physical connection problem. For example, your USB cable may need to be replaced. There is a network problem. If you are syncing through the network, check to make sure that the connection isn’t cutting out. There is a software problem. There could be some compatibility or software problem with iTunes. Get the latest version of iTunes before you do anything else. If it’s a software problem, this can often fix it. To do this, go to Help > Check for Updates on iTunes. Turn off your iPod by holding down the Sleep/Wake button until a slider appears. Slide this to turn off your iPod. Turn it back on by pressing and holding the Sleep/Wake button again. Just to be on the safe side, reboot your computer after you’ve updated iTunes. This will solve most problems. Check to make sure your iOS device is correctly plugged into the computer. Swap out the USB cables and see if the one you were using was bad. Make sure your router is working correctly. Make sure your computer and devices are able to connect to the network. You can do this by launching iTunes, going to Store, and then choosing Authorize This Computer. You will then have to input your Apple ID. If iTunes isn’t doing it right, you could try to prevent compatibility problems by converting your music before you add it to your library or sync it with your iOS device. Finally, you can use a third-party tool called iMyFone Music Transfer to simply sync music to iPod. TunesMate can fix the problem when some songs won’t sync to iPod. It does this by simply being able to transfer nearly any kind of file, and not needing any kind of complicated network connection to do it. Transfer music to iPod, iPhone, iPad from computer drive, iTunes, CDs, external hard drive. Sync music to iPod from anywhere without replacing old music library on iPod. All music formats are supported to sync as incompatible formats will be converted when transferring. Get songs from iPod to computer or iTunes including non-iTunes purchased music. Also manage playlists, movies, ringtones, audiobooks, podcasts, iTunes U, music video, photos and more. How to fix “songs won’t transfer from iTunes to iPod”? Step 1: Install iMyFone Music Transfer to your computer. Plug your iPod in and then launch the application. Step 2: Click Transfer iTunes Media to iDevice. Select the kinds of files that you want to transfer. Click Transfer. How to sync songs to iPod from computer/external hard drive? Step 1: Again, install iMyFone Music Transfer onto your Mac or PC, then connect your iPod with a USB cable. Open TunesMate. Step 2: Click the Music tab at the top. Click Add > Add File or Add Folder. Step 3: Browse for the music files or folder that you want to add, then click Open. 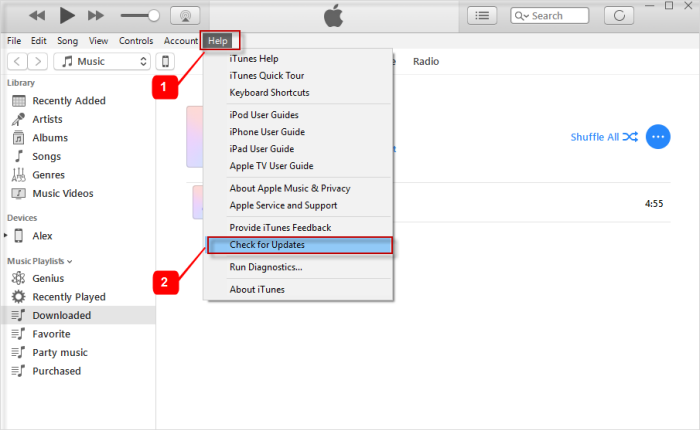 When your songs won’t transfer from iTunes to iPod or other device, don’t panic! This is a common problem and there are many solutions. One of the best solutions, though, is to simply install iMyFone Music Transfer onto your computer. It is more reliable than iTunes and doesn’t require a network connection or even the same Apple ID between devices. You simply plug your device in and you can start transferring with just a few clicks.